Now in its fourth year, the restyled 1949 Monarch weighed in at a hefty 1306 kilos (3,500 pounds). The Six-Passenger Coupe listed for $2,595 f.o.b. Windsor, Ontario. If bigger was better, then Monarch was truly King of the Road. The marque had first bowed in 1946, the latest addition to Ford’s Canadian family. The very posh, badge-engineered brand initially shared a shell with Ford. Strategically positioned between the mid-priced Mercury and the luxurious flagship Lincoln, Monarch went a long way to filling Ford’s considerable product line gap. The creation of Monarch made it that much easier to be loyal to the blue oval as one moved from Ford to Mercury, then Monarch before purchasing the penultimate product that the Windsor, Ontario automaker could offer, the Lincoln. Monarch’s direct competitors were Chrysler, Hudson, Nash and Oldsmobile. Ford of Canada spared no pains to ensure that Monarch was every bit as upscale as the competition. The 1949 Monarch Sport Sedan topped the scales at 1336 kilos (3,580 pounds) and carried a list price of $2,635 before Ottawa and the provinces added their taxes. The 1949 Monarch was introduced to the public May 1, 1948, kicking off one of the longest selling seasons that Ford of Canada’s dealer body would ever have. Every line in the beautiful automobile spoke of grace and speed. Advertising said bluntly, “The differences between Monarch designs and other cars are so obvious and definite that other cars instantly seem old fashioned.” New from the ground up, designers chose a “functional streamlined” look for the shell shared by the new baby Lincoln, the Mercury and Monarch. The resulting envelope was decidedly low to the ground. The sizzling car came with its very own mock tabloid newspaper, The Monarch News. Designed to impress prospective buyers, the bold black headlines screamed, “New Monarch Makes Car News!” and “New through and through! Quality UP! Power UP! Size UP!” A drawing of a bright red Coupe filled the front page. New Beauty, New Body, New Chassis, New Engine, New Frame, New Springs was the news. 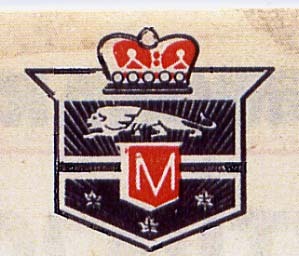 The regal Monarch crest graced the hood, the front doors, wheel covers and the rear of Canada’s King of the Road. Monarch’s silhouette hugged the road, reaching a scant five foot three inches at the highest point of the roofline. Stem-to-stern chrome body spears carried unique cat-eye reflectors at the leading edges of the front fenders. Touted as a safety feature, the reflectors let oncoming traffic know how wide the Monarch really was. The theme continued, wide openings in the massive grille permitted the radiator to take in more air. 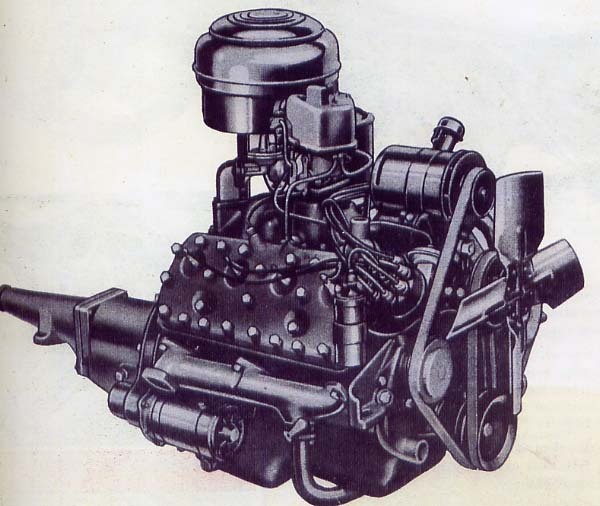 Under the hood was a “new V-type Eight” with 49 noteworthy features. Among them was a higher 110-horsepower rating and a new automatic choke with automatic fast idle built into the dual concentric carburetor. This engineering advance eliminated the need for a hand choke. The engine was bolted to the frame at three points. The trio of engine mounts were made of special rubber, bonded to steel, in order to absorb engine vibrations and provide the quietest ride ever. The Monarch’s V-8 mill generated 110 horsepower and boasted two water pumps. Sharing its body shell with Mercury and the new baby Lincoln, Monarch luxuriated on a 2997-millimetre (118-inch) wheelbased X-frame replete with additional K-type reinforcements. If that wasn’t enough, box section side rails—fore and aft--were part of the mix, too. All this was needed to accommodate the extra weight and the extra-wide body. The unusually low centre section permitted a lower interior floor. Passengers did not stumble over steps or trip on sills when embarking or alighting from a Monarch. Cavernous, luxuriously appointed interiors were a hallmark of the Monarch. In 1949, leather upholstery was an extra cost option. The cabin was not only roomy but richly appointed. Six passengers travelled in “satisfying luxury.” Safety glass was featured throughout. The V-type, split windshield was rakish, blending effortlessly into the curve of the roofline. The three-piece rear window was simply elegant. Measuring 1.5 metres, (five-foot) in width, the expansive seats were upholstered in a choice of Blue Striped Broadcloth, a Green Check Broadcloth or Tan Bedford Cord. Leather was an extra cost alternative. Oversized armrests were standard equipment, front and rear, as well as a very useful robe rail. Thoughtful touches included a glove compartment light and assist loops for rear seat passengers in the Six-Passenger Coupe. Monarch’s instrument panel brought round gauges and dials together in front of the driver in a raised cluster unit. 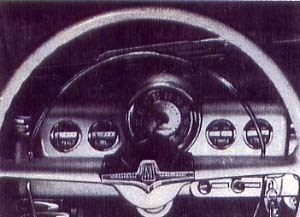 The instrument cluster of the 1949 Monarch brought all dials and gauges directly in front of the driver. Ottawa was still struggling to right its balance-of-debt payments to Washington. The problem was grave enough that there were restrictions on select consumer goods. 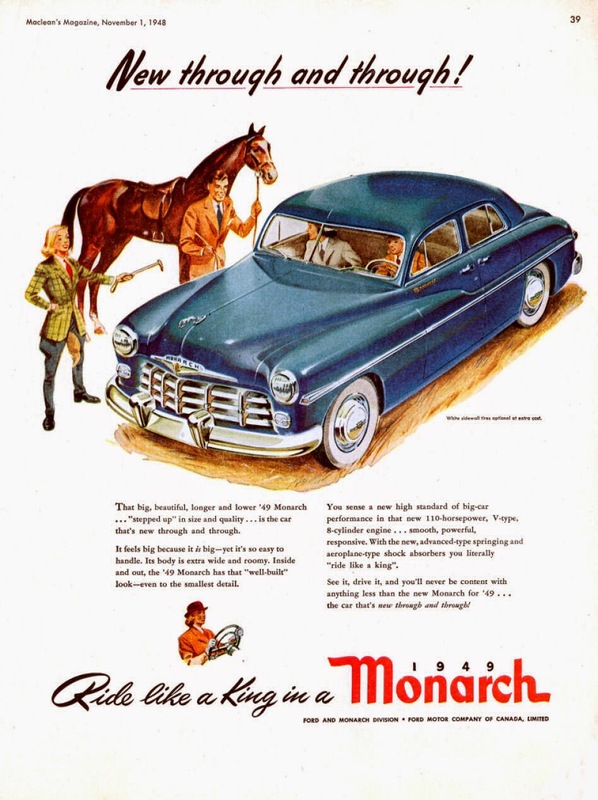 Advertising for Monarch was careful to not--in the fine print--that extra-cost, optional equipment for Monarch would include fender skirts, white sidewall tires and chrome wheel trim rings--when they became available. A lack of optional equipment was a minor inconvenience for Ford compared to GM’s problems in Oshawa. The Federal Government had simply stopped manufacture and importation of Buick. None had been built or sold since the last McLaughlin-Buicks had rolled off the lines in 1942. Canadians would do without Buicks, and GM would do without the profits, until the1951 model year when the balance of payments had finally been redressed. 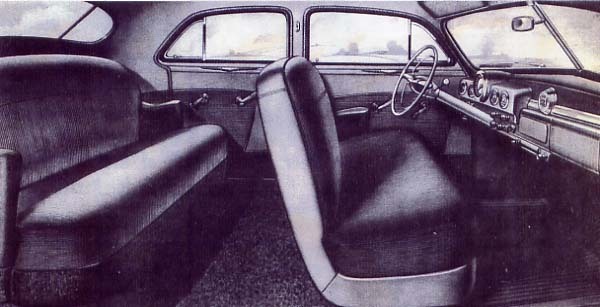 Offered only as a six-passenger Coupe and a Sport Sedan for the 1949 model year, records show that early plans called for the introduction of a Monarch Fordor Sedan. Those plans were advanced enough that opening serial number SN-0373H49-5001 was assigned. However, it appears that there was a change of heart; none of this model was built. Who can drive in our car with peace of mind. The best and smoothest of restful rides. The 1949 season was the best ever for Monarch. The marque finished out the model year with 11,317 units produced by Ford workers in Windsor, Ontario. It was the eighth best selling car in the Dominion, behind Chevrolet, Meteor, Pontiac, Ford, Plymouth, Dodge and Mercury. Studebaker was ninth in production and Oldsmobile took tenth place. 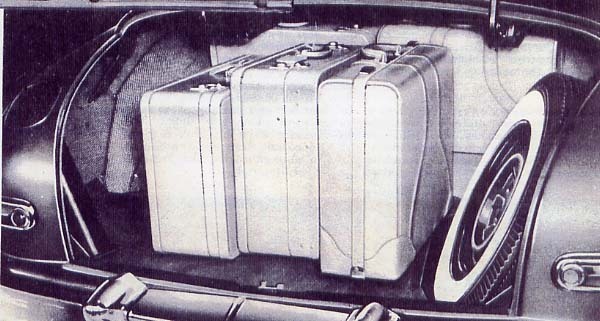 Cargo space grew by nearly a cubic metre (25 square feet) in the 1949 Monarch. Loading was made easy with a counterbalanced trunk lid. A luggage compartment light was part of the standard equipment package.